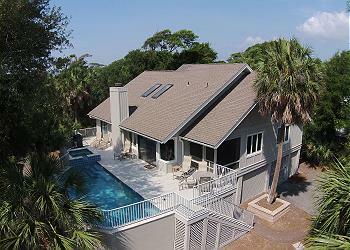 Coastal cottage and sandcastle all rolled into one in this 2nd-row ocean, Lowcountry beach home. A large open porch with rocking chairs welcomes you with southern hospitality. As you enter you're greeted by a large great room that encompasses the living room, dining room, and kitchen with breakfast bar. Leading out from the dining area is a large *heated pool, patio, and grill secluded in privacy from rich shrubbery and palm trees. There are 2 king bedrooms with en-suite baths. All just a few flip flop steps from the beach and the Atlantic Ocean in the heart of popular North Forest Beach! the season. If you would like to heat the spa only, the cost per week is $225 + tax.